Coffee is bad for you, right? Coffee is high in antioxidants. Antioxidants help boost the immune system, improve the arterial function and help the stress response. Coffee boosts exercise performance. In endurance events, you can go for longer at a higher intensity before getting tired if you drink coffee prior to competing ion an event. Drinking coffee before lifting weights, will enable you to lift more and experience less muscle soreness after. Coffee is also great for the liver. You can cut your risk for liver disease in half by drinking two to five cups of unsweetened coffee per day. Please note that is important to stop drinking coffee by 2pm to ensure that it does not disrupt the body’s natural rhythm and sleep patterns. This entry was posted in Foods, Health, Nutritional guidance on 10/08/2017 by Soza Health. How much fibre do you eat every day? Most people are not eating enough. Average fibre consumption is around 15g per day, but the ideal diet contains over 100g per day and anything below 32g is considered deficient. So why is fibre important? Fibre is a prebiotic, meaning it feeds the helpful bacteria in your gut. These bacteria ensure that you are digesting your food properly and extracting the nutrients efficiently. They can also reduce inflammation and cancer risk, and positively regulate your mood. Fibre is also important to maintain a healthy level of cholesterol. Excess cholesterol passes from the blood into the digestive tract where it can bind to soluble fibre. It is then removed in your stool. In the absence of fibre in the digestive tract, the cholesterol passes back into the blood stream, where it can contribute to weight gain and attach to the inside of the arteries, increasing cardiac risk in the long term. The best sources of dietary fibre are whole plant foods, in particular, oats, flax seeds, chia seeds, quinoa, beans, avocado, coconut, artichoke, figs, almonds, walnuts, asparagus, okra, squash, peas, pears, berries and mangoes. You should aim to eat over 35-40g of fibre each day. This entry was posted in Foods, Health, Nutritional guidance and tagged fiber, Fibre on 10/08/2017 by Soza Health. Unfortunately, in the western culture, physical reactions such as ‘throwing-up’, headache, general malaise and even temporary loss of consciousness have been normalised as humorous consequences of an excessive intake of alcohol, and not recognised as the body’s urgent attempt to counter intoxication. Alcohol intake can have a damaging effect on the health and wellbeing of individuals and families. Interestingly, research conducted by Age UK** suggests that middle class people over the age of 50 not only consume greater levels of alcohol but also fail to recognise the harm that increasing alcohol consumption can cause. This entry was posted in Foods, Health and tagged alcohol, drink, toxic on 31/05/2016 by Soza Health. Changing dietary intake to comprise the eating of smaller meals at more frequent intervals is thought to be more beneficial for weight loss than eating larger meals less frequently. This is likely due to improved control of glucose levels, better appetite control, and increased calorie use by the body during digestion. Also eating protein at regular intervals during the day increases muscle mass after exercise training, as more protein is available for repair, regeneration and growth of muscle tissue. The number of calories you burn throughout the day while at rest is largely dependent on muscle mass and a fat burning diet can be enhanced though gains in muscle. Maintaining or increasing muscle mass is a key factor in health as we age and also with survival and recovery from many disease conditions. The best results were observed when daily calorie intake was split over 5 or more meals a day. Increased fat loss as well as gains in muscle mass were noted. A high protein diet in conjunction with higher feeding frequency, has also shown beneficial effects on body composition, greater appetite control has also been observed with higher feeding frequency, with many people consuming less calories when adopting this method. Eat little and often (5+ small meals per day). Eat slowly and focus on chewing food thoroughly. Be careful not to exceed daily calorie intake (using a small side plate for meals can help you judge portion sizes). Also do not snack between meals. Keep to a balanced diet with low glycaemic index, high protein and vegetable content. Thick soups or healthy green smoothies fill you up more quickly with smaller portions. Exercise (you will see better gains in muscle mass from eating protein regularly throughout the day). This entry was posted in Foods, Nutritional guidance and tagged daily calorie intake, Diet, dietary, exercise, high protein diet, meals, muscle mass, muscle tissue, nutrition, weight loss, weight management on 12/02/2015 by tomaszgeorgesoza. Apple cider vinegar is often looked upon by natural wellness enthusiasts as a panacea for all good things. Taking a tablespoon or two of it every day is said to cure everything from gout to allergies and more. It’s said that it is important that the apple cider vinegar you take be organic and have the “mother” in it to be of most benefit to you. The mother is a stringy-looking ball of matter that either floats at the top or settles at the bottom of a bottle of the vinegar and is the source of its sour, fermented taste. This entry was posted in Foods on 20/12/2014 by Soza Health. Do you suffer from recurring heartburn, chronic indigestion or ulcers? Medical researchers are now finding that capsaicin – the pungent compound that gives ‘heat’ to cayenne, chili and jalapeno peppers – is harmless to the digestive tract. Hot peppers do not, in fact, cause or even aggravate ulcers. In fact, capsaicin may actually have therapeutic effects. How does capsaicin help to heal the gut? Not only can capsaicin-rich peppers dramatically reduce symptoms of heartburn and indigestion after a few weeks of use – they also have a strong protective effect on stomach tissues. How do hot peppers work to reduce pain? When your body’s tissues are exposed to capsaicin, the initial response is to release substance P, a neurotransmitter that carries pain messages to the brain. This is the reason that eating hot peppers can make you feel as if your mouth – and your stomach – is on fire. The benefit comes with repeated exposure to capsaicin, through frequent and regular consumption of hot peppers. When capsaicin regularly contacts a specific site on the body, levels of substance P actually become depleted at the nerve terminals in that location. The result – significant reductions in pain. Science raves about capsaicin for digestive disorders Numerous studies, both animal and clinical, support the ability of capsaicin to relieve uncomfortable digestive symptoms when used over time. Capsaicin’s preventive effects on gastric mucosa have also been well documented in both animal and human studies. In addition to beneficial capsaicin, hot peppers also contain important micronutrients. Their bright orange-red color is a testament to their high levels of beneficial flavonoids, particularly carotene – an antioxidant pigment that gives color to carrots. Rich in antioxidant vitamins A and C, cayenne peppers also contain lutein and zeaxanthin — which may help prevent age-related macular degeneration – and are a good source of manganese, a mineral the body needs to manufacture the antioxidant enzyme superoxide dismutase. Finally, hot peppers are fiber-rich and cholesterol-free. 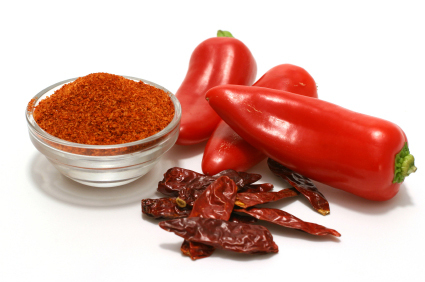 You can promote digestive healing with spicy food Hot peppers, also known as cayenne peppers and chili peppers. These can be enjoyed as spicy delicacies either cooked or raw. They are recognized as generally safe; however, moderation is the best course – avoid eating quantities that are larger than normal dietary amounts. This entry was posted in Foods and tagged cayenne pepper, Foods, nutrition on 24/05/2014 by johnogden11.